SuperHeroStuff.com | Can I backorder an out of stock item? Can I backorder an out of stock item? If you are interested in an item or size that is listed as ON ORDER we can most likely backorder that for you! 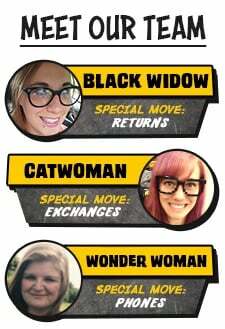 Please inquire with our Customer Service team at help@superherostuff.com for more information. If an item is listed as "out of stock" or "sold out" that will not be eligible. Sorry!